This month, the City of Ottawa is beginning an update of its soils mapping in rural Ottawa to improve the information it uses to protect agricultural land and to guide future land use planning. Soil experts will work with the Ontario Ministry of Agriculture and Food as well as the Ministry of Rural Affairs in Guelph. They will ask land owners for permission to sample and map soils conditions in two to three test areas. Landowners within the test areas will be contacted by City of Ottawa Rural Affairs staff in May about the survey staff acessing their lands to conduct the survey. The results of this work will lead to the development of a more comprehensive survey in 2015 to cover the remainder of the City. This update is being undertaken in conjunction with provincial staff. The Province uses soil capability mapping to determine and protect the most productive lands for farming. Farmers use this mapping for a variety of purposes, including managing use and distribution of fertilizer to make their farm operations more efficient. The results of the surveys undertaken in 2014-2015 will be added to the City's existing and highly accurate topographic information to produce some fo the most up-to-date and accurate soil capability mapping available in Ontario and the review of the City's policies for the protection of Agricultural areas. Despite the snow this past weekend and the cold last week, there are ongoing signs that spring is, indeed, on the way. The City of Ottawa has closed its 56 approved sledding hills for the season due to milder temperatures, which have resulted in unsafe conditions for sledding. The public is urged to keep personal safety in mind and remain off the sledding hills. Notification of the re-opening of the hills in the winter of 2014-15 will be available on the City’s website at ottawa.ca. Even with the fresh pile of snow that we received on the weekend, it's best to forego the sledding hills and look to other fun outdoor activities. Last Monday (March 24), seasonal load restrictions began. Commercial vehicles or trailers with a gross vehicle weight in excess of five tonnes or 11,000 lbs. per axle are prohibited on roads where restriction signage is posted, and on all truck routes identified as restricted on the Truck Route Maps (Urban Truck Routes and Rural Truck Routes). These restrictions also apply to all non-truck routes. Heavy vehicles that exceed weight limits on restricted load roadways during the spring thaw period will be subject to fines. During the spring thaw period, some roads cannot withstand heavy vehicle loads. Every year, the City monitors thaw progression by utilizing the forecast temperature data to calculate the Thaw Index. 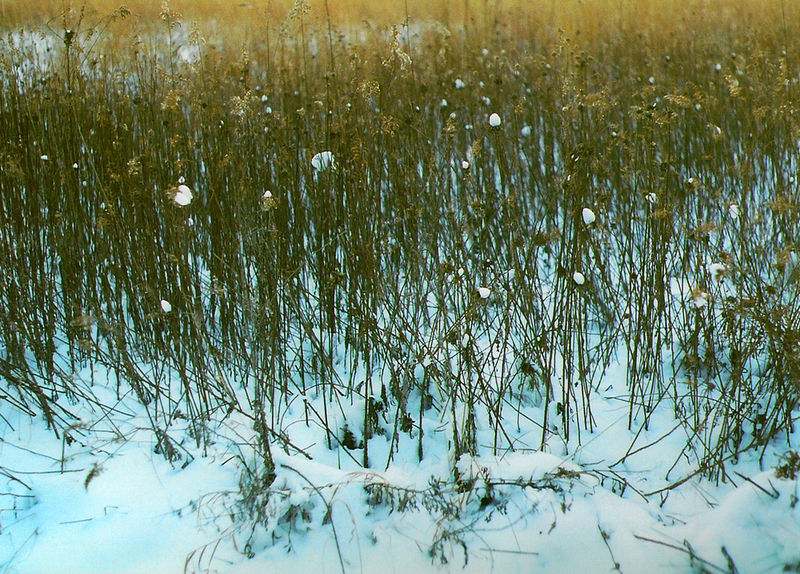 When the Thaw Index reaches its threshold value, the load restrictions are imposed. Once the pavement strength has been restored, the load restrictions are removed. For further information, please visit ottawa.ca. It's always important this time of year to be cautious of ice on local bodies of water. It may look solid, but that can be deceiving. Avoid going out on the ice to be on the safe side. And since we're on the subject of ice, the City of Ottawa has been doing flood prevention on the Rideau River for over 100 years. The workers get to use some pretty fun looking equipment to prevent ice damming that can create local flooding. Watch this video to see how they blast the ice to prevent flooding of the river each year! Now let's hope the weather starts to warm up! strengthens the community sport and recreation sector by providing training in areas such as coaching, youth development, and volunteer development to provide enhanced service and quality programming. Through the support of projects that deliver high-quality programs and policies, the OSRCF provides Ontarians with more opportunities to become physically active, including groups who experience barriers to participating and those who are traditionally less active. The program supports projects of one or two years in length, at both the Local/Regional and Provincial levels. Deadline for local / regional projects is Thursday, February 20, 2014 at 5:00 pm EST. For more information, visit www.grants.gov.on.ca. The following events and awards are potentially of interest for residents and farmers in rural communities. Grow Your Farm Profit (GYFP) workshops are now being offered across eastern Ontario. Farmers are invited to participate and learn more about Growing Forward 2 opportunities that will soon be available. Several other locations in eastern Ontario area are available. For more information and to register for workshops visit www.ontariosoilcrop.org. Environmental Farm Plan (EFP) workshops are now being offered across eastern Ontario. Farmers are invited to participate to update their EFP and learn more about Growing Forward 2 opportunities that will soon be available. For more information and to register for free workshops, including other available dates and locations in the Ottawa area, visit www.ontariosoilcrop.org. Applications for the 2014 Premier's Award for Agri-Food Innovation Excellence program are being accepted from January 10 to February 28, 2014. The program recognizes innovators who contribute to the success of Ontario's agri-food sector. Program applications will be reviewed by two independent panels made up of representatives from across Ontario's agri-food industry. For more information, visit http://www.omafra.gov.on.ca/english/premier_award/. Registration is now open for the 27th annual Kemptville Winter Woodlot Conference to be held on Wednesday, February 19 at the W.B. George Centre on the Kemptville Campus of the University of Guelph. This annual educational and networking event is a must-attend for private woodlot owners, and associated commercial, service, government, and non-government organizations. Information: www.eomf.on.ca. Nomination deadline is March 31, 2014. For more information, please visit www.dairyfarmers.ca. 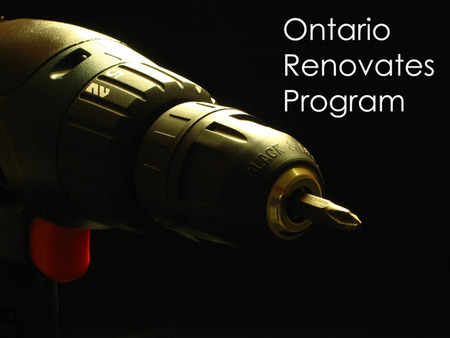 The Ontario Renovates Program administered by the City of Ottawa’s Housing Services Branch, provides limited funding to low income seniors who own their home and to persons with disabilities for necessary home repairs and accessibility modifications to support independent living. The program is also available to qualifying landlords to modify their existing units or buildings to make them more accessible to eligible seniors and persons with disabilities. Homeowners who are 65 years of age or older, persons with disabilities and/or families with a household member(s) that have a disability, may qualify for assistance, if the property is eligible and if the total gross annual income of the household meets the income requirements. See the website for income tables. Your home may be eligible for the program if it requires repairs and/or modifications to make it safer, more accessible and more energy efficient. Examples of acceptable repairs are listed on the website. For more information call 613-580-2424, ext. 12300. Program applications are available to download on the City of Ottawa’s website. The Ministry of Economic Development, Trade and Employment’s Eastern Ontario Development Fund (EODF) will build on the competitive strengths of eastern Ontario to attract new investment, encourage innovation, and create local jobs. In 2012, the Ontario government passed the Attracting Investment and Creating Jobs Act, renewing the Eastern Ontario Development Fund (EODF) and creating the new Southwestern Ontario Development Fund (SWODF). These funds will help diversify and strengthen each region’s economy by encouraging businesses to pursue innovation and new markets, while creating jobs. Promote innovation, collaboration, and cluster development. Eligible projects would enhance productivity and competitiveness; create high-value, sustainable jobs; increase exports; and promote a culture of innovation. Who can apply and how much support is available? The Business Stream is available to help businesses pursue growth that creates jobs. Projects can focus on developing new products or markets, increasing productivity, and improving the competitive position of the business. Have a multi-year project with a minimum $500,000 investment in eligible project costs. Businesses with 5-10 employees may be eligible under the Small Community Pilot. Under the business stream, the EODF may provide up to 15 per cent of eligible project costs to a maximum grant of $1.5 million. Investments of over $10 million that create at least 50 jobs may be eligible for a secured, repayable loan capped at a maximum of $5 million. For the purposes of the EODF, Eastern Ontario is composed of 15 geographic areas, including the entire City of Ottawa. Drinking contaminated water can make you sick and can even be fatal. Bacterial contamination causes stomach cramps and/or diarrhoea as well as other problems. 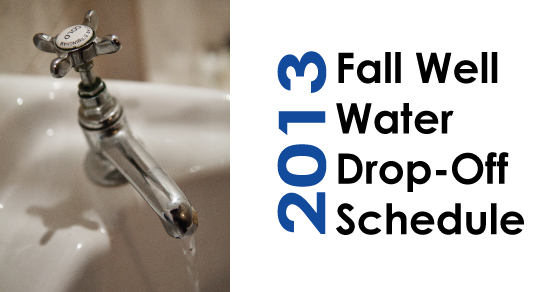 Make sure your well water supply is safe to drink by testing it regularly - test for bacteria three times a year and after major plumbing work. Visit www.ottawa.ca/water for more information. The Community Partnership Minor Capital Program is an initiative available for minor capital improvements to city-owned parks, recreation and cultural facilities on a cost-sharing basis with community groups. Examples include: play equipment, basketball courts, park furniture, tree planting, landscape improvements, minor community facility improvements, etc. The Community Partnership Minor Capital Program is an initiative to implement minor capital improvements to parks and recreation facilities on a cost-sharing basis. The City’s budget for the program is set annually and funding is apportioned by district based on population. City matches the community contribution for projects on City property to a maximum of $7,500 or 50% of the total cost of the project. City’s total contribution to a project on school board land or other public land will be up to one-third of the total cost of the project, to a maximum of $7,500. The balance of the capital cost will come from the community group alone, or together with the landowner. Projects on school board land and other public lands that are accessible to the general public may also be eligible. Deadline: May 1. Information: ottawa.ca or 613-580-2424, ext. 23169. The next deadline to apply is September 1. During the spring thaw period, typically early March to mid-May, some City of Ottawa roads cannot withstand heavy vehicle loads. Every year, the City monitors thaw progression by utilizing the forecast temperature data from Environment Canada and Weather Network to calculate the Thaw Index. When the Thaw Index reaches its threshold value, the load restrictions are imposed. Depending on the progression of the thaw, restrictions can come into effect quickly, sometimes with only a few days notice. The City also conducts deflection testing to monitor pavement strength as the thaw progresses. Once the pavement strength has been restored, the load restrictions are removed. As of 12:01 a.m., Wednesday, March 13, 2013 commercial vehicles or trailers with a gross vehicle weight in excess of five tonnes or 11,000 lbs. per axle are prohibited on roads where restriction signage is posted, and on all roads identified as restricted on the Truck Route Maps (Urban Truck Routes [PDF – 827 KB] and Rural Truck Routes [PDF – 1.5 MB]). These restrictions also apply to all non-truck routes. Heavy vehicles that exceed weight limits on restricted load roadways during the spring thaw period will be subject to fines. Local restrictions will remain in effect on the identified City roads until further notice (typically, mid May). For further information on seasonal load restrictions, please call 3-1-1. City Planning Staff will attend the meeting to answer questions and listen to the conversation. For more information about the proposed policies, visit ottawa.ca/liveableottawa and read the Comprehensive Five year review of the Official Plan staff report that was tabled at the March 26 meeting of Planning Committee. The Summer Experience Program (SEP) provides funding to eligible not-for-profit organizations, municipalities, Aboriginal organizations and First Nations in order to create meaningful summer employment opportunities for students. The summer employment positions must focus on activities supporting key sectors within the ministries of Citizenship and Immigration and Tourism, Culture and Sport. Applications must be submitted online through Grants Ontario by midnight (EST) on Friday, March 22, 2013. For more information, visit http://www.grants.gov.on.ca/. 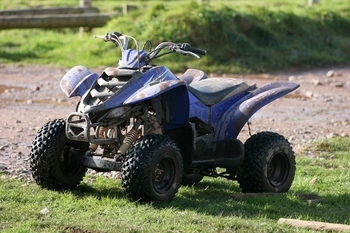 As per the direction of the Agriculture and Rural Affairs Committee, the City of Ottawa Rural Affairs Office is developing regulations to allow all terrain vehicle (ATV) use on certain municipal roadways (both opened and unopened) in Osgoode Ward on a pilot project basis. A map of the proposed trail network is available for review and comment on the Rural Connections website at ottawa.ca/rural. For more information, and/or to provide feedback on the proposal, please contact the Rural Affairs Office at ruralaffairs@ottawa.ca or 613-580-2424 x23852. The City of Ottawa wants to know what you think of its rural pathways! In 2011, Council approved the Rural Pathways Shared Use Policy, which included a two year monitoring program and a requirement to report back this summer (2013). Part of the monitoring program includes a survey requirement where public users can have their say about their experiences. This survey is now live and you can give your input online now. The City of Ottawa has three major rural pathways that cover 65km (combined) of converted rail lines. The pathways provide significant year-round multi-use recreational pathway links. The Prescott-Russell Pathway extends eastward from the greenbelt near Blair Road through the Village of Navan to the Prescott-Russell Trail at Canaan Road. The Osgoode Pathway extends southward from Leitrim Road to Buckles Street in Osgoode Village. The Ottawa-Carleton Trailway extends westward from Bells Corners near Fitzgerald Road through Kanata and Stittsville to Ashton Station Road and beyond to the Town of Carleton Place. The Ottawa-Carleton Trailway is part of the Trans Canada Trail. What is the shared use policy? 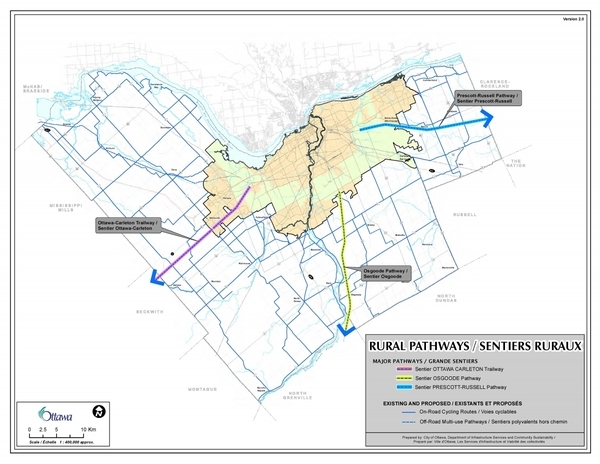 The Rural Pathways Shared-Use Policy was approved by the City Council in February 2011 following a comprehensive study of similar pathways in other jurisdictions. Particular attention was given to pathways with a history of shared use without injuries to trail users. Under the policy, all motorized vehicles are prohibited on the pathways from spring to fall to provide the best environment for the pedestrians and cyclists who are the primary trail users during this period. Snowmobiles are allowed on the pathways in the winter but are subject to restrictions, such as speed limits and curfews. The City is reviewing the Rural Pathways Shared-Use Policy to ensure comfortable and enjoyable experiences for all pathway users. The survey results will be collected and analyzed to help the City develop appropriate policies and programming to improve experiences and interactions on the pathways. The survey will be available from March 1 to April 15. City teams will also be on site to interview pathway users during this time. Visit ottawa.ca/ruralpathways and ottawa.ca/sentiersruraux to tell us what you think. The 2012 Canada-Ontario Forage and Livestock Transportation Assistance Initiative is available for certain Ontario livestock producers who are facing severe forage shortages due to this summer’s dry weather. This AgriRecovery initiative provides up to $2.4 million to help eligible producers in designated drought areas by offsetting extraordinary transportation costs incurred to transport hay, straw, silage and green feed to livestock or eligible breeding livestock to a feed source. Designated drought areas: Bruce, Brant, Grey, Haldimand, Huron, Lanark, Norfolk, Oxford, Perth, Renfrew and Wellington counties, the cities of Hamilton and Ottawa and the regional municipalities of Halton, Niagara and Waterloo. 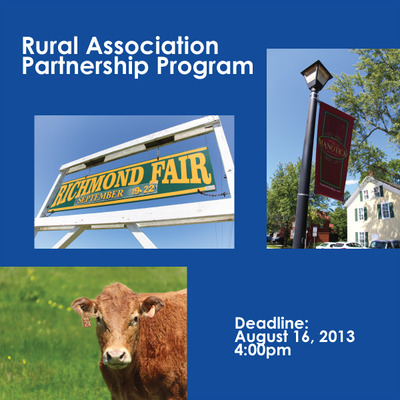 Forms and program information are available on agricorp.com. The deadline to apply is March 22, 2013. Producers are encouraged to submit forms online for more efficient processing and to avoid incomplete applications. Producers can also submit paper forms by mail, fax or in person. As always, Agricorp’s Customer Care Centre at 1-888-247-4999 is available to answer program-related questions. Identifying lands that are vulnerable to flooding is an important responsibility for Ontario’s Conservation Authorities. Over the next five years, three conservation authorities will be undertaking a number of flood risk mapping studies on watercourses within the City of Ottawa and their respective areas of jurisdiction. For some watercourses old flood risk mapping will be updated and for some watercourses flood risk maps will be created for the first time. When completed, the new flood risk mapping will be used by the City of Ottawa when updating its Official Plan schedules and Zoning overlays and in the review of development applications under the Planning Act. Conservation Authorities will use the same mapping in the administration and enforcement of regulations made under the Conservation Authorities Act. For more information, or learn how to provide input in the process, please visit the RVCA's website. Source: MorguefileCoyotes are commonly found in open, agricultural land that includes woodlots and areas covered with brush. 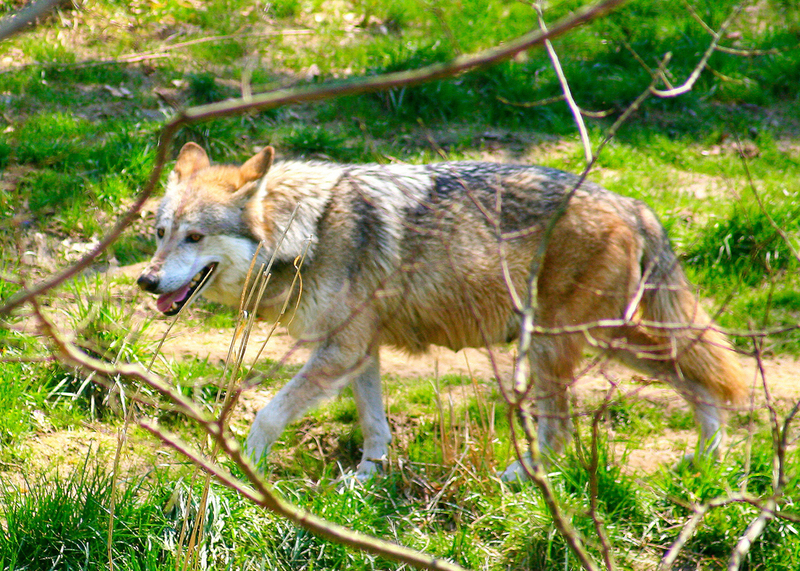 In cities, coyotes prefer natural green space, such as parks, ravines and stream banks. Taking these steps will help encourage coyotes to find somewhere else to look for food. Most importantly, never feed coyotes or other wildlife. For more information about coyotes, visit MNR's website. For more information, contact the City of Ottawa Rural Affairs Office at 613-580-2424 x28352 or ruralaffairs@ottawa.ca. Planning staff from the City of Ottawa would like to thank the over 400 residents that participated in the five Village Zoning Public Information Sessions this October. As a result of comments received at these sessions, changes will be made to the draft zoning maps for Villages.